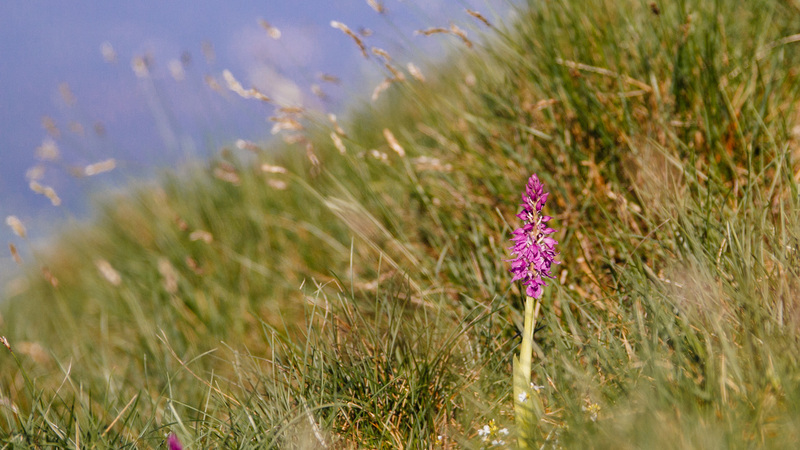 The Nanos plateau is an independent mountain range with great natural beauty. 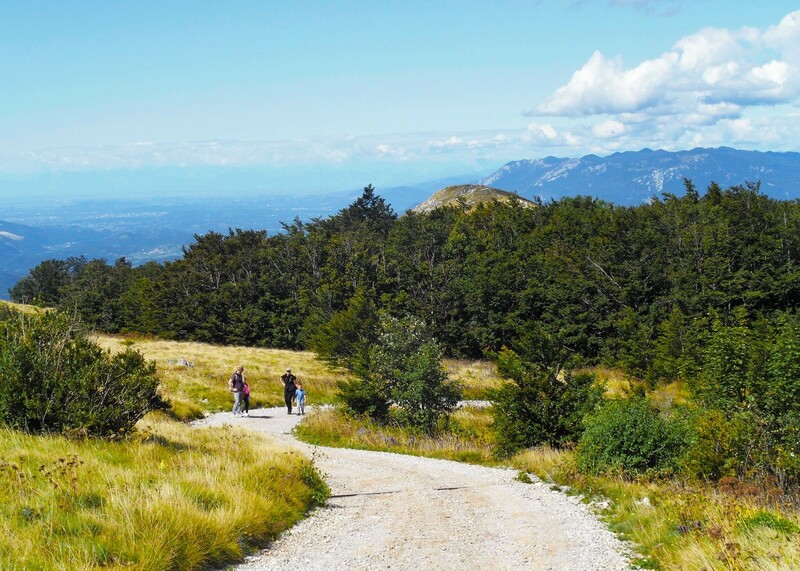 The sights include a spectacular view of Slovenia and its neighbouring countries. When the weather is clear you can see many landmarks of Slovenia, including the Kamnik-Savinja Alps, Triglav, the highest mountain in Slovenia, Snežnik, Trnovo forest, Friuli Venezia Giuliain Italy, the Gulf of Trieste, the karst limestone region, and even St Mark’s Square in Venice. The beauty of Nanos enriches its visitors’ every moment, giving them the opportunity to creatively spend their free time in all seasons of the year. Here they can see a number of unusual sights. Nanos is mostly frequented by mountaineers, cyclists and others interested in outdoor sports, who always like to return again and again. The Nanos plateau is also an interesting place for businessmen who would like to see the Nanos transmission site, artists who can relax in its great natural beauty, and researchers who come to see the glacial features, measure the climate and investigate geological structures. 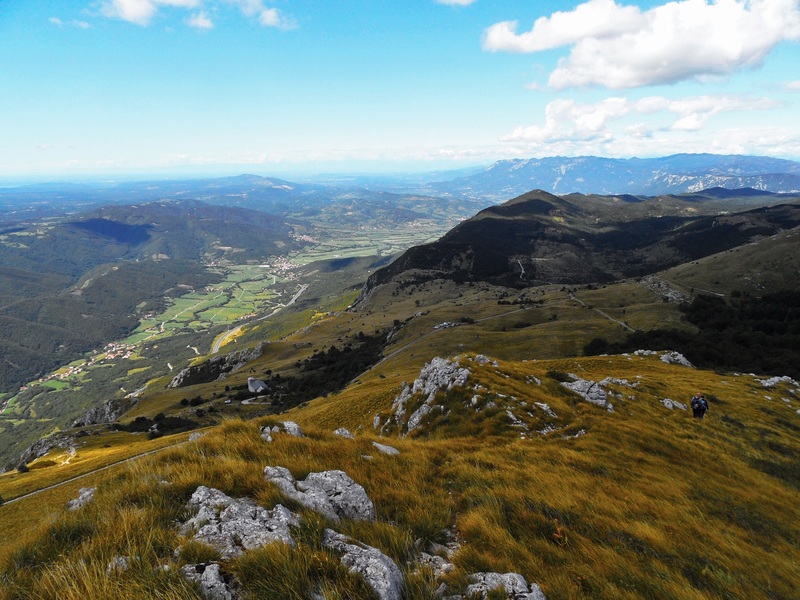 This plateau is crossed by the Slovenian High Level Route, the Transverzala; the Via Alpina European Footpath, and the Slovenian Geological Route. At its foot also lies the St. Jacob road which leads to Santiago in Spain. The hillside with its great beauty fascinates and enchants visitors, who like to come back again and again to recharge their batteries and spend time in the fresh air. A number of mountaineers have stopped at the transmission site’s entrance while wandering around the area, rung the bell and asked if there is any chance to look around the site. Following this interest, we have enriched the slopes of Nanos from the tourist point of view by giving them the possibility of visiting the Museum of Analogue Transmission Techniques at the Nanos transmission site. Nanos stands alone as a karst plateau, lying between the Vipava Valley, Pivka, Hrušica and the Bela canyon. It is approximately 12km long and 6km wide, with a varied terrain and an abruptly sheer edge, named Pleša (1,262m). 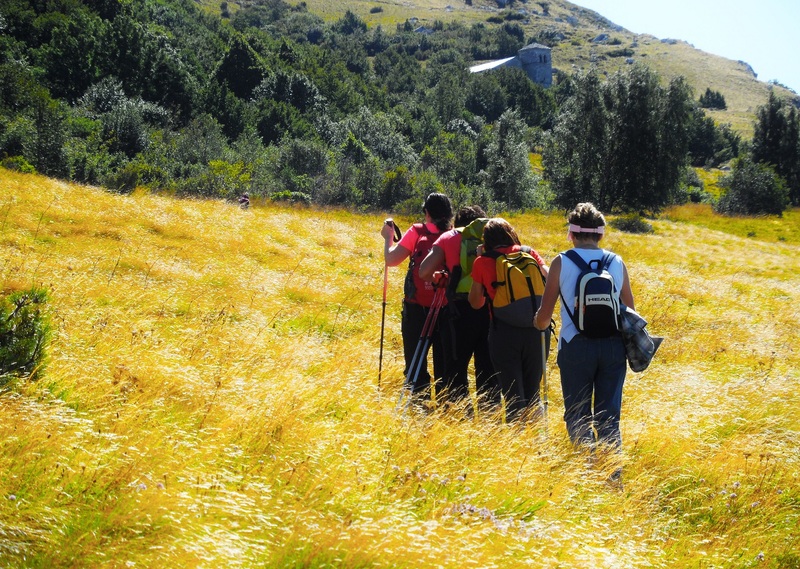 The slopes cover a surface of 65 km2, comprising more than half of the Vipava Municipality. Nanos and Snežnik are the most typical mountains of the Notranjska region. The Predjama fault separates the area on the eastern side from the karst plateau Hrušica, where the dry Črnjavska Valley stretches towards the north-west (towards Podkraj). The Bela Valley separates the area from the Trnovo forest to the north and north-west. 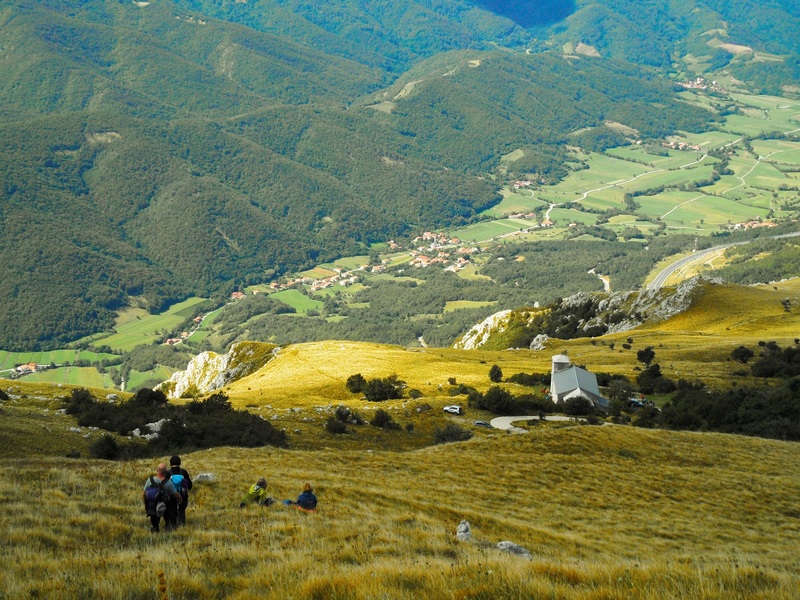 On the south-western side there are 500-700m high precipitous slopes named Breg and Rebrnice, which sweep down to the upper part of the Vipava Valley. On the surface of Nanos you can find numerous elongated sinkholes covering the upper part of the plateau, divided into elongated valley and domed slopes. 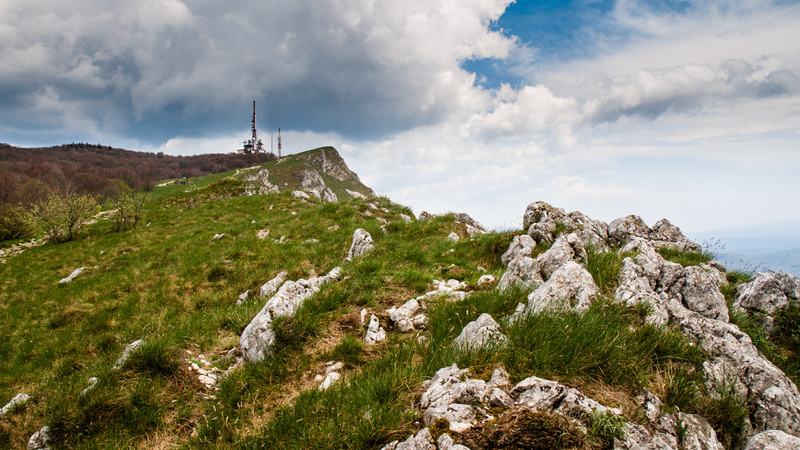 The highest peak, Suhi vrh (1,313m), lies in the southeastern area, but the most obvious summit is Pleša (1,262m), which lies in the extreme south, directly above the village of Razdrto. The Nanos TS stands on the slopes of Pleša, where the Museum of Analogue Transmission Techniques was opened in July 2014. Just below the Nanos TS is the mountain hut Vojkova koča. The average altitude of the Nanos plateau is around 1,100m, while on the western side the height is a bit lower (800-900m). Here also the surface is less rocky. Nanos is part of the Dinaric Alps barrier, which separates the Mediterranean climate of Goriška and the coastal regions from the moderate continental and partly sub-alpine climate of Central and Eastern Slovenia. Moist air masses, moving from the Adriatic Sea towards the interior, rise and deposit large amounts of precipitation on the first barrier they reach, such as the Nanos plateau is. According to measurements made at the Nanos Ravnik weather station, the average annual rainfall was 1760mm in the years between 1971 and 2000. During those thirty years, the highest quantity of rainfall, on average 200mm, was recorded in October, followed by November and June with around 180mm, and the lowest quantity, i.e. around 100mm, was recorded in February. Snow lies on the slopes for about 65 days per year. During the same period, the average air temperature was highest in July and August at 16°C, while the lowest is expected in January, with an average of -1°C. The area of Nanos is home to the bora, the strongest and the most intense wind in Slovenia. This typically gusty wind is created during the passage of a cold front of a Mediterranean cyclone, when cold air encircles the eastern edge of the Alps above Central Slovenia, rises across the western and southern slopes of the Dinaric plateaus and then rapidly descends towards the Mediterranean area. The strong bora wind, with gusts over 100 km/h which can break trees and destroy roofs, is a regional phenomenon blowing along the edge of the Trnovo forest and Nanos and through the Vipava Valley, where it is strongest between Rebernice and Vipava. On the slopes of Nanos you can find numerous ice caves which are also natural monuments. These are: Loški and Podraški ledenik, Veliki and Mali trški ledenik and Slapenski ledenik. The steepest one is Slapenski, measuring 112 metres. In the past they used to cut the ice and sell it to remote places, even Egypt. These ice caves are easily accessible and of different depths. On the slopes of Nanos there are various chapels and signs representing our cultural heritage. In the southern area of the plateau, there are three interesting churches. The most famous and the highest of these is the church of Sveti Hieronim (St. Jerome), situated at a height of 1,019 metres on a grassy plain of the south-western edge of the Nanos plateau. 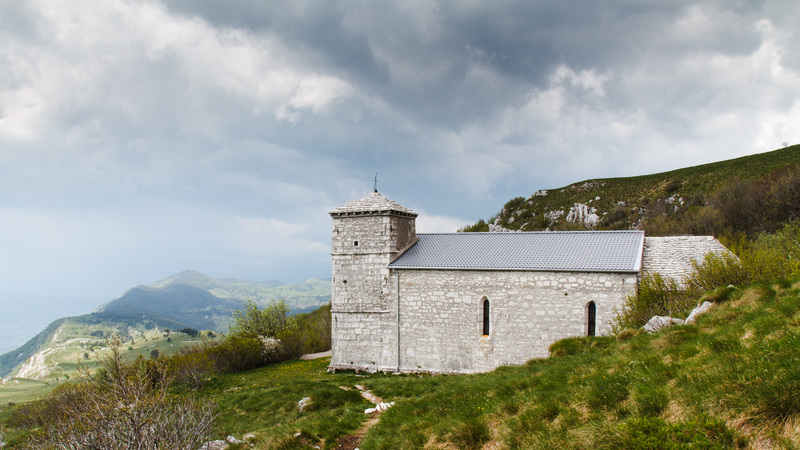 The church of Sveti Brikcij or St. Brice is located south of Suhi vrh, under the slopes of the hollow wall, lying at a height of 965 metres. 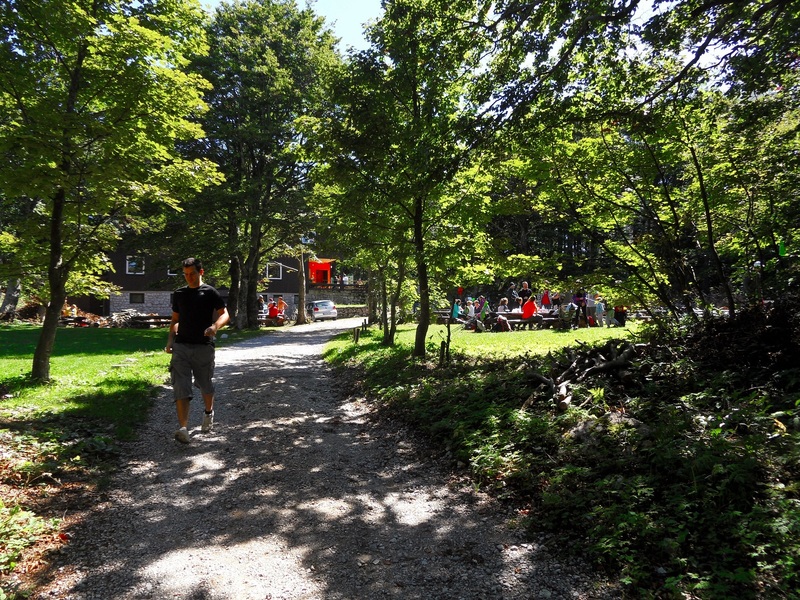 Standing in the middle of the forest, it unfortunately gives no view to visitors. On a beautiful high area above the two villages of Dobrava and Gradišče pri Vipavi a small church dedicated to St. Nicholas was also built. In the centre of the Nanos plateau, you may also notice two bajte (huts), i.e. podraška and podnanoška. The latter is owned by the fire brigade, who renovated it a few years ago. In the past they used to serve as shelters to haymakers and foresters in stormy weather. The church of St. Jerome lies on the slopes of Nanos directly below Grmada, on the eastern side of the plateau. It was built at a height of 1,018m, designed as a pilgrimage church. From here there is a wonderful view of the whole Vipava Valley and the karst region as far as the coast. The church is mentioned for the first time in archive documents from the year 1360. This information is proof of the existence of a sanctuary on Nanos. However, there is no further information on whether the old church stood in the same place or was of the same size. It is thought to have gained its present form during the 16th and 17th centuries. Over the next few hundred years it was renovated several times, because of the climatic conditions, as well as people who came here to dig for treasure, being convinced that it was located here. In the church interior there is a single nave and a vestry on the left-hand side. On the right-hand side a 15m-high bell tower leans against the church; it contains two bells. The main altar is renovated in a Baroque style. The Academy-trained artist Tomaž Perko painted a mural in the altar niche of the kneeling hermit, St. Jerome, praying in front of the cross. The church is enriched by four other paintings by the same artist, namely St. Ann with Mary on the left-hand side, St. John the Baptist on the right-hand side, St. Egidius on the southern wall and the virgin Mary on the northern wall. At the back of the church there are stone stairs on the southern side, leading to the choir or to the bell tower. Under the choir, in the western part of the church, members of the Association of Scientific and Technical Translators of Slovenia erected a stone memorial plaque in 1994, devoted to their patron St. Jerome. Once upon a time, every year, floods would destroy the field crops of the farmers of the Vipava Valley. St. Jerome, a good hermit, took pity on them and decided to help them. He suggested that he went to live on Nanos, where there is a marvellous view. He promised to light a big fire when a storm was approaching. In exchange, the farmers brought him food and other things needed for survival. Each time the farmers saw smoke on the peak of Nanos, they quickly harvested their crops. When St Jerome was on his deathbed, he promised to also help them after he died. However, he would no longer warn them with smoke, but with haze. And so it remains today: when bad weather is approaching, haze can be seen on the slopes of Nanos, hiding its peak. The farmers proclaimed Jerome a saint, and to express their gratitude they built a church dedicated to him on the spot where he used to light the beacon fires.